Acme H3-224EFR storage server, 2U rackmount, hardware RAID, Black Color. 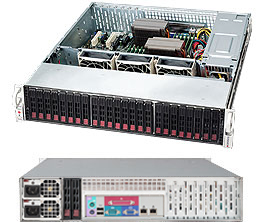 This system is good performance multi-function/ storage system for email, database and VM applications. This will be a high performance NAS storage box if storage OS (like Windows storage server 2012, Open-e) was installed. 2U case with 920W redundant power supply, Platinum level 80+. 24 of 2.5" HDD bays ( w/ backplane SAS2 expander, hot-swap). option to add 2 of 2.5" hot-swap. ** add a JBOD port for SAS2 JBOD expansion box.